PÅ DENNE SIDEN VIL DU FINNE KUNNE LASTE NED PRESENTASJONER, ARTIKLER OG FOREDRAGSMANUS FRA VÅRE KURS OG KONFERANSER. TRYKK PÅ TEKST FOR Å LASTE NED. 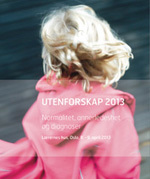 UTENFORSKAP 2013: Normalitet, Annerledeshet og Diagnostisering. Young adulst of ethnic minority background on the Norwegian labour market: The interactiona co-construction of exclusion by employers and customers. Social exclusion and inclusion of young immigrants. Presentation of an analytical framework. Er alt testbart? Testing, kartlegging, diagnostisering - og hva så? Inkludering - på hvilke premisser? Diagnoser i arbeidet med atferdsproblemer blant barn og unge - konsekvenser og alternativer.